Tonight was an early start - with a club night being held after the gig a 10pm curfew meant that for all four bands to get a decent length set then the doors were opened at 5pm with the first band Majesty on stage at 5.30. An early start on a weeknight almost always means the first bands play to an empty venue as people haven't had time to get home from work let alone go out to a gig, so I was very surprised to see that by the time Majesty went on stage the venue was already very busy, which gives a pretty good idea of how popular the lineup is. German band Majesty kicked the night off. Manowar style metal can be a bit cheesy and Majesty are no exception to that, but they put in a great set and got the crowd going, getting them to chant "hail hail to Majesty", fists in the air and so on. Cheesy but still good fun to listen to, and a great start to the night. Next up came the band I was most looking forward to - Battle Beast. This was the band's first trip to the UK, and my first time seeing them since the departure of their previous singer, who quit as the band were preparing to record the second album. By this time the venue was packed, and Battle beast came out and proceeded to blow everyone away. With a set made up of songs from both their albums they were here to impress, and they did that with style. 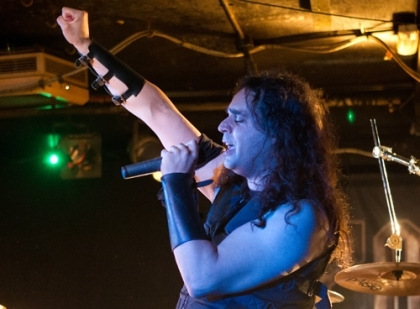 New singer Noora has the perfect voice for the band's traditional heavy metal music, and like the rest of the band looks to be having a great time on stage. This was one hell of a good performance and the crowd loved it - they got a better reception than many headline bands I've seen at this venue, and the crowd was a sea of fists in the air for much of the set. This may have been their first trip to the UK but after the amazing reception they got tonight then I hope a promoter will get them over here again soon. 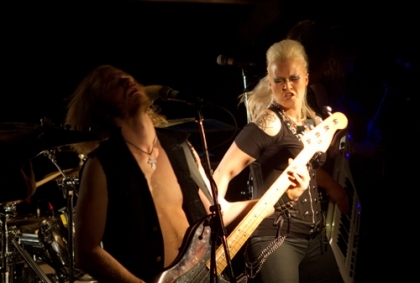 After a stunning performance from Battle Beast then it was going to take something special to folow them. Unfortunately though the very disappointing Ashes to Ares were up next and their pretty average sounding performance definitely fell pretty flat with the crowd. The vocals were poor, particularly on the higher notes, and generally it sounded like they hadn't rehearsed - I've heard better performances from bands in pubs I'm afraid. Frankly whoever decided they deserved to be so high on the bill screwed up hugely - based on the performances of the bands tonight and the crowd reactions then Ashes to Ares should have been opening the night, followed by Majesty, and it's a toss-up between Battle Beast and Powerwolf as to who should have been headlining - for me though Battle Beast edge it by a fraction. After Ashes to Ares had killed the atmosphere (and boosted trade at the bar at the back of the venue significantly), it was time for the headliners - Powerwolf. They kicked off with my favourite song of their - "Sanctified by dynamite", an awesome track that did what was needed and got the crowd energy levels straight back up. Definitely a good way to start the set. Having seen Powerwolf at Wacken at the start of August I knew pretty much what to expect, and I wasnt disappointed - Powerwolf are a great live band, and tonight they go down superbly well as they put in a polished professional performance with plenty of power and energy. The drum solo was a bit disappointing and probably only appealed to other drummers, but other than that it was hard to fault their performance. If you haven't seen Powerwolf play live then I certainly recommend that you try and get to one of their shows. Overall then tonight was a great night - two superb bands in the form of Powerwolf and Battle Beast, one very good band (Majesty) and one very disappointing band (Ashes of Ares). Despite the early start and finish the bands packed the place out and gave the fans a great night for their money. Let's hope Powerwolf and Battle Beast do proper UK tours in the near future so fans outside London can experience these great bands.